A diary from the mid-1800s reveals surprising real-life links to William Faulkner novels such as Go Down, Moses, Absalom, Absalom! and more. Pretty damn awesome. Proof that redheads are insensitive. 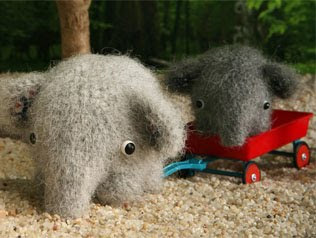 Total blog find: Tada's Revolution, a magical, miniature world populated by crocheted animals. If you don't like it, you hate all things good. A headline: "Dog Eats Diamond Worth $20,000." Photodocumentation of a tour of a rather nicely decorated Santa Barbara home. Wikipedia's list of alternative names for the British. All fifty-seven varieties of Heinz-brand bottles goop. Among them: Heinz Plum Pudding, Heinz Peanut Butter, Heinz Mock Turtle Soup and Heinz India Relish, which I would guess is chutney back before Americans knew what that word meant. Debunking the myth of Lady Jane Grey.